The London Borough of Hackney (/ˈhækni/ ( listen) HAK-nee) is a London Borough in Inner London, United Kingdom. The historical and administrative heart of Hackney is Mare Street, which lies 5 miles (8 km) north-east of Charing Cross. The borough is named after Hackney, its principal district. 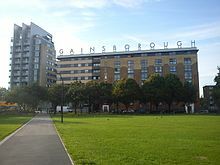 Southern and eastern parts of the borough are popularly regarded as being part of east London, with the north-west belonging to north London. The modern borough was formed 1965 by the merger of the Metropolitan Borough of Hackney with the much smaller Metropolitan Boroughs of Stoke Newington and Shoreditch. Hackney is bounded by Islington to the west, Haringey to the north, Waltham Forest to the north-east, Newham to the east, Tower Hamlets to the south-east and the City of London to the south-west. Hackney was one of the host boroughs of the London Olympics in 2012, with several of the Queen Elizabeth Olympic Park venues falling within its boundaries. After both areas were brought under the control of Alfred the Great, the river became the boundary between the historic counties of Middlesex (Hackney) and Essex (modern Newham, Waltham Forest and Redbridge). The parish church of St John-at-Hackney was built in 1789, replacing the nearby former 16th-century parish church dedicated to St Augustine (pulled down in 1798). The Borough is currently divided into twenty-one wards which between them return fifty-seven councillors. Fifteen of the wards return three councillors and the remaining six return two each, in a first past the post system of elections. Ward boundaries are regularly revised, with the last review being in 2014. Unlike most other English local authorities, the Borough is now governed by a directly-elected Mayor who is also the political leader of the Council. The Mayor – currently Philip Glanville  – is supported by a cabinet, councillors and a Speaker who fulfils the civic and ceremonial duties previously undertaken by the (non-political) mayor. The borough comprises two parliamentary constituencies: Hackney North and Stoke Newington (represented by Diane Abbott MP) and Hackney South and Shoreditch (represented by Meg Hillier MP); both are Privy Counsellors and Labour Party Members of Parliament. The borough is in the North East London Assembly constituency returning Jennette Arnold AM, as the directly elected Assembly Member. Hackney is part of the London constituency in the European Parliament. The constituent parts of the borough are Hackney, Shoreditch and Stoke Newington. Originally Ancient Parishes, these areas have had consistent boundaries since the mediaeval period. Parishes in Middlesex were grouped into ‘Divisions’, with Stoke Newington part of the Finsbury Division and Hackney and Shoreditch part of the Tower Division. The Tower Division was noteworthy in that the men of the area owed military service to the Tower of London. The Metropolis Management Act 1855 merged the Civil Parishes of Hackney and Stoke Newington under a new Hackney District. This proved very unpopular, especially in more affluent Stoke Newington and after four unsuccessful attempts the two parishes regained their independence when they were separated by mutual consent under the Metropolis Management (Plumstead and Hackney) Act of 1893. The London Government Act 1899 converted the three Civil Parishes into Metropolitan Boroughs based on the same boundaries. There were minor rationalisations, notably that Shoreditch absorbed part of the tiny Liberty of Norton Folgate (with the rest going to neighbouring Stepney), while Stoke Newington absorbed the South Hornsey exclaves of Hornsey. The shield is surmounted by a representation of Hackney's St. Augustine's Tower. An eight-pointed Maltese Cross, for Hackney, which derives from the symbols of the Orders of the Knights Templar and Knights of St. John, both of whom held the Manor of Hackney. Bells representing Shoreditch, these are the bells in the nursery rhyme Oranges and Lemons. Oaks for Stoke Newington, representing its origins in the Forest of Middlesex. The borough was formed by the merger of the metropolitan boroughs of Hackney, Shoreditch and Stoke Newington, with the boundaries of these very closely based on the Ancient Parishes of the same name; these areas have been consistently defined for many centuries. Historically, the River Lea formed the boundary between the predecessor counties of Middlesex and Essex. Localities in the London Borough of Hackney. Within these areas are a large number of sub-districts, some of which have sub-districts of their own. These areas are generally based on former hamlets which expanded and merged as the area urbanised. These sub-districts have never been administrative units so have never had any formal boundaries, however a degree of informal definition has developed. The sub-districts typically take Metropolitan Borough\Ancient Parish boundaries where available, and can also have customary boundaries such as roads, railways, postcode boundaries or a combination of these as publicly understood limits. Despite this, many areas have only a weakly or partially understood extent and it is not unusual for perceptions of place to overlap or change over time. Hackney is seen as part of East London and includes : Homerton, Dalston (including Kingsland and Shacklewell), Upper and Lower Clapton, Hackney Central, Hackney Wick, South Hackney, West Hackney, De Beauvoir Town and Stamford Hill - with the last three of these not always counted as part of East London. Shoreditch is part of the East End\East London and includes the sub-districts of Hoxton and Haggerston. Stoke Newington proper is part of North London. 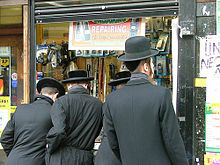 The formal and traditional eastern boundary is Stoke Newington High Street, but West Hackney is sometimes informally considered part of the area. The London Borough of Hackney covers an area of 19.06 square kilometres (7.4 sq mi), rising westward from the Lea to reach 30 metres (98 ft) above sea level at Clapton Common and Stamford Hill. The area around Victoria Park, in the south of the borough lies about 15 metres (49 ft) above sea level..
After the Norman Conquest the area became part of the Forest of Middlesex which covered much of the county, but this gives rise to misunderstanding, as in this context ‘Forest’ is a legal term referring to royal hunting rights and had a weak correlation with woodland cover, especially in the early post-Conquest Period. By the time of the earliest reliable maps, in the 18th century, the area covered by the modern borough was an agricultural area characterised by enclosed farmland with small hamlets and very little woodland. There were a number of commons most of which survived to become the basis of modern parks. Many of the major roads were present by this time, the road now known as the A10 was Roman, and others, like many in England, may be older. With the obvious exception of the urbanisation of the area, the greatest changes have been to the waterways and wetlands of the area. The River Lea, the area's primary geographic feature, has lost its grazing marshes and seen the River Lee Navigation created in 1770. This is an artificial channel of the river, passing through Hackney Cut and across the Hackney Marshes to straighten a meander of the natural river. In Roman times and for a long time after, the River Lea was an estuary, tidal as far as Hackney Wick. At Hackney Wick the Hackney Brook met the Lea; the confluence was very wide when flooded. Hackney Brook was fully culverted in 1860 by the Metropolitan Board of Works. The New River was opened in 1613, diverting water from the Lea catchment to create a source of drinking water for London. The New River still passes through the borough, close to Finsbury Park and flows towards Islington. Another man-made feature, the Regents Canal also crosses the borough to the south of De Beauvoir Town in the west, joining the Hertford Union Canal below Victoria Park. Light industries in the area around the River Lea employ over 3,000 people. The population is ethnically diverse. Of the resident population, 89,490 (44%) people describe themselves as White British. 24,861 (12%) are in other White ethnic groups, 50,009 (24%) are Black or Black British, 19,791 (9%) are Asian or Asian British, 8,501 (4%) describe themselves as 'Mixed', and 6,432 (3%) as Chinese or Other. According to the GLA Population Estimate for 2018, 36.4% of the borough's population are White British, 18.1% are "Other White", 10.3% are of Black African heritage, and 6.4% are of Black Caribbean heritage. Hackney is also home to several smaller Asian communities. Every ward remains among the 10% most deprived in the country, with 47% of children living in low-income households. Hackney has a reputation as one of the most crime-ridden London boroughs, and some of its streets have even been referred to as "Murder Mile", but cooperation between local police and council has resulted in the borough experiencing a bigger drop in crime than in any other London borough in the four-year period up to 2007 (28% reduction). In 2002, the borough entered into a ten-year contract with the Learning Trust, an independent collaborative body that organises education for Hackney's 27,000 pupils in over 70 schools, nurseries and play centres. The trust was set up in response to an OFSTED report that identified failings in the then existing system. Two of London's most successful City Academies are in Hackney with another two in development and plans to rebuild or renovate every other Hackney school by 2016. LBH regained responsibility for education in 2012, absorbing the Learning Trust under the new name Hackney Learning Trust. Hackney has only one London Underground station, on the fringe of the borough. Manor House on the Piccadilly Line is located on its extreme north-western fringe on the boundary with Haringey. It is proposed that Crossrail 2 will provide Hackney with its first underground station at Dalston with the potential of the future ‘eastern branch’ with stops at Hackney Central and Hackney Wick. The borough also has informal links with South Africa, Turkey, and Saint Vincent and the Grenadines. The Homerton University Hospital has its own twinning arrangements with the Rambam Health Care Campus (Haifa, Israel) and St George's Hospital (Grenada). Schools are encouraged to pursue links with specific schools abroad – such as the arrangement between Our Lady's and a school in Hangzhou, South West China. ^ "London Places" (PDF). Greater London Authority. Greater London Authority. Archived from the original (PDF) on 6 September 2015. Retrieved 3 September 2015. This article incorporates text from a publication now in the public domain: Chisholm, Hugh, ed. (1911). "Hackney" . Encyclopædia Britannica. 12 (11th ed.). Cambridge University Press. p. 794. ^ "Hackney: Roman Landscape". Building Exploratory:Brickfields. ^ "The history of the word "Hackney"". Worldwidewords.org. 11 May 2002. Retrieved 20 November 2011. ^ CNRS – Nancy Université. "Centre National de Ressources Textuelles et Lexicales". ATILF. Retrieved 21 June 2015. ^ Statistics for ethnicity , country of birth , and religion "Archived copy". Archived from the original on 10 January 2009. Retrieved 5 February 2010. CS1 maint: Archived copy as title (link) are from the UK census. ^ "Libraries | Hackney Council". hackney.gov.uk. Retrieved 27 June 2018. ^ "2011 Census: QS701EW Method of travel to work, local authorities in England and Wales". Office for National Statistics. Retrieved 23 November 2013. Percentages are of all residents aged 16-74 including those not in employment. Respondents could pick one mode, specified as the journey’s longest part by distance. ^ Barnett, Marissa (27 February 2014). "Austin picks up 13th sister city in London borough of Hackney". Austin American-Statesman. Cox Media Group. Archived from the original on 27 June 2014. Retrieved 28 February 2014.